Click this button in my sidebar and take the FREE MOTION CHALLENGE. 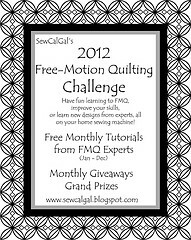 What a great opportunity to hone those FMQing skills or learn a new way to quilt! There's also a chance to win a monthly prize.